Most seniors suffer from fall-related injuries in their homes. It is for this reason why fall prevention needs to be designed in a home where there is an elderly person. 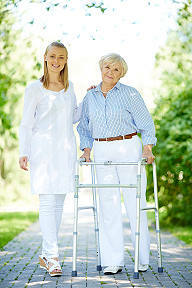 The elderly can suffer broken hips and fractures from a simple fall basically bones weaken as a person ages. And some of these falls can be life-threatening. This checklist has outlined some of the changes and adjustments you can make in a home to improve safety for a senior. There should be easy to maneuver traffic patterns in the home. This means no furniture or tables to get in the way. Boxes should be removed from traffic patterns and electric and phone cords should be maintained close to the walls. Hallways should also be clutter free. Many seniors fall trying to reach for items that are high up, using a step stool to get to items out of reach. Household appliances, bed covers, and clothing should be stored at a height where they can be easily reached, preferably about waist high. While reaching for items can cause a fall, so can bending down to retrieve something as it is not uncommon for seniors to become dizzy when standing up. If there is a stairway in the house, make sure it is equipped with securely fastened handrails. Consider the removal of any carpet on the staircase and replacing it with rubber, non-slip pads. Alternatively, confirm that the carpet is firmly fastened to the stairs. To make the steps easier for a senior to see, add brightly colored reflective adhesive tape to the edge of each step. All flooring needs to be even. Any carpets or rugs should be removed if it is frayed, or fastened with tacks if they have to remain. While wall to wall carpeting is fine, it is easy to trip on the edge of a decorative or throw rug. You can alternatively use non-skid pads on the flooring to help with fall prevention. Many falls happen in the bathroom. The bathtub needs to be easy for a senior to get into and out of. The addition of grab bars to the shower walls is an easy and excellent way to increase safety in the home. The soap dish should be within easy reach. As an alternative, use a wall mounted dispenser of liquid soap so there is no concern about the bar of soap being dropped and the senior falling as she tries to retrieve it. Use a non-slip mat in the tub and any rugs in the bathroom should have a non-slip backing. If that is not possible, put a non-slip mat just outside the tub. Install a bolted rod for the shower, one that will hold a person’s weight in case it is grabbed to prevent a fall. Frequently used utensils should be within easy reach. If a step stool is needed in the kitchen, it should be one that has a sturdy grab bar. The installation of lazy Susan trays in the cabinets makes it easier for the senior to reach all of the cabinet items, without having to resort to standing on a stool. In lower cabinets, this type of storage will bring items within easy bent-over reach, making it unnecessary for the elderly to get down on their knees to reach an item in the back, and then have to get standing again. If the senior is unsteady, this getting down and then getting up motion can lead to falls. Every room in the house should be brightly lit. This includes rooms, stairways and hallways. Using light motion sensors is a very good option, providing light as soon as the senior moves into range. This way there is no need to be reaching for light or lamp switches which might be out of range. In hallways and staircases, there should be light switches at both ends. The lighting should be uniform throughout the home. If there is different lighting throughout the house, it can disorient the elderly, leading to falls. Access to the home should be clear and accessible. Uneven sidewalk joints should be repaired. Railings should be installed by all stairs. Arrangements should be made so that any snow, ice or leaves are removed quickly from walkway and stops. Outside lights should be bright and cover any pathways and stops. The outside of the house is another area where the installation of motion sensor lights is an excellent option for safety and fall prevention for elderly residents.